Join with your friends and family and let’s make a night to remember to spend with Adele in her Spirit Speaks Galleries™ platform Mediumship, as she opens the doors into the spiritual realms of how she receives her messages from spirit and the Angelic Wise Ones®. As a Visionary Adele sees thru the veils and walks all worlds in a color of the spirit world energy. From the moment she begins you will know her sense of genuine peace and love in why she is called The Visionary Messenger, communicating not only those in spirit but to you, the audience members. As a Visionary Adele sees thru the veils and walks all worlds in a color of the spirit world energy. Even though Adele will deliver as many messages as she can, not everyone will receive messages from your Loved Ones, Spirit Guides, Angels or Furry Friends as they may come through in what Adele refers to as “heart to heart ” messages, this is where there is a sharing of messages from one individuals loved one in spirit that matches the same message you loved one wants you to hear too. Leaving you with a sense of knowing peace and love that our loved ones have made that connection thru all audience members. At the end of evening Adele will be present to answer a few of your questions. This extraordinary night will be one of love, laughter and light™. 2017 and We are Traveling to a City Near You… Keep your eyes open ! Please don’t wait to purchase your tickets for these events we would hate to have to tell you we were all sold out. This is a wonderful opportunity for Adele’s clients who are waiting for their private reading sessions to see and meet Adele’s before their own personal and private experience to have a deeper understanding of the work she does with spirit. This extraordinary night will be one of love, laughter and light™. Must be 18 years of age to attend. All minors 16 and above must be accompanied by adult/guardian and said such adult /guardian as all content is kept in the purest of avenues, however some messages may contain a level of language that may not be appropriate for minors to hear. Adele & Guest Mediums will always be mindful of their audience members. All Spirit Speaks Galleries™ are copyrighted audio and video recorded for all Angelic Wise Ones®, Angel Light Productions™ to the viewer audience’s world wide. By attending theses Spirit Speaks Galleries™ and public events with The Visionary Messenger Adele Marie you are authorizing your permission as you may be filmed, photographed, taped or recorded and may appear in all/any media format for promotion and/or publicity. Attendance/participation at All Spirit Speaks Galleries™ event(s) does not guarantee you will receive a message or be read. 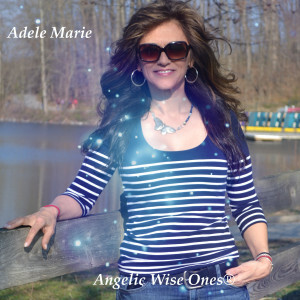 All Rights Reserved CopyRight2014©Adele Marie/Angelic Wise Ones® Angel Light Productions™ holds no liability of any harm to any audience member. You may be asked for your feedback after the show to be specifically used by Angelic Wise Ones®, Angel Light Productions™ for all intended purposes in production of all said properties with no monetary return due you. Spirit Speaks© Galleries are not be used to replace any medical advice and as always if you are in need of medical advice, assistance and supervision, please visit your health care provider. Copyrights for entertainment purposes only, and production of Televised and Audio Recordings of all and said future writings are the property of Angelic Wise Ones®, Angel Light Productions™ and Spirit Speaks Galleries™. Our mission is to bring you quality spiritual venue and events that keep you moving and growing in these times of astonishing current spiritual happenings worldwide. With some of the most well known Spirit Speaks Presenters that you may find anywhere else. These Spirit Speakers will uplift you and deliver to you the messages that you are waiting to hear from all of your Spirit Guides, Angels, Furry Friends and Loved Ones in Spirit.